The foundation of the Scouting Movement by Lord Baden Powell was soon followed by a branch in Hawick around 1908. 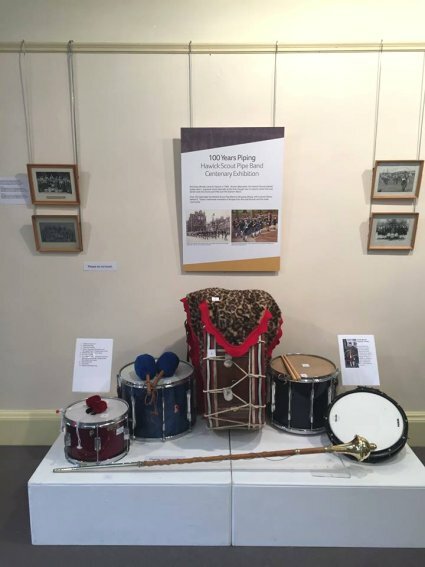 We had previously thought that the first mention of a Pipe Band was in 1917 (as the Hawick Boy Scout Pipe Band) but the following items have since come to light from 1914, and it is clear that the band was established before then. Undoubtedly encouragement and assistance would have come from some of the servicemen stationed at Stobs Camp. Early records showed that the band played on the streets of Hawick on Armistice Day, 11th November 1918. The band fell away during the depression years, but was resurrected again in 1936. The Ancient Sutherland Tartan still worn by the band dates from the early years when a local sculptor of that name, who used to operate fom premises in Bridge Street in front of the present Scout Hall, was District Commissioner. Many members of the band were called up at the start of the second World War and some never returned, including pipe Major Willie Johnstone, KOSB, who was killed in action but the pipes he played in the battle of Normandy are still in regular use by the band. To this day the band plays at Remembrance Day services at up to five local parishes annually. One of our previous Pipe Majors was the late Jock Laidlaw, who until his recent death was the last Piper in the British Army to have led his battalion into battle. Another was Jock Rae, the only local Piper to have had the honour of being Solo Piper at the Edinburgh Military Tattoo. For the last 25 years Charlie Turnbull has been Pipe Major; he was a piper with the Royal Marines and whilst serving with them played in many countries throughout the world. The band plays at a number of local events including agricultural shows, the Summer Festival, the Christmas Parade on the High Street and the Vertish Hill Sports. We also take part in Massed Bands displays at Floors Castle, several Common Ridings around the Borders, and were part of the World's Largest Massed Pipe Band in Edinburgh in July 2000. We played at the Royal Mile and Holyrood Palace as part of the Millennium celebrations and have performed at Berwick Military Tattoo several times. A highlight was playing a national Scout and Guide concert in the Royal Albert Hall, London - an experience the performers will never forget. In 2002 members went to New York for another World Record Massed Bands attempt in aid of cancer charities and also to Plymouth Naval Dockyard for their Navy Days display and Tattoo in August alongside the Plymouth Pipe Band, of which Charlie Turnbull was a principal founder. Later in the year we played at Murrayfield before the Scotland South Africa game. Currently led by Michael Bruce, the band takes new members both from within the local Scouts and anyone else who is interested, including adults, hence its present Fellowship status, which allows a stable core of adult organisers. New members, experienced or complete beginners of both sexes are always welcome. The main commitments are determination and steady practice.